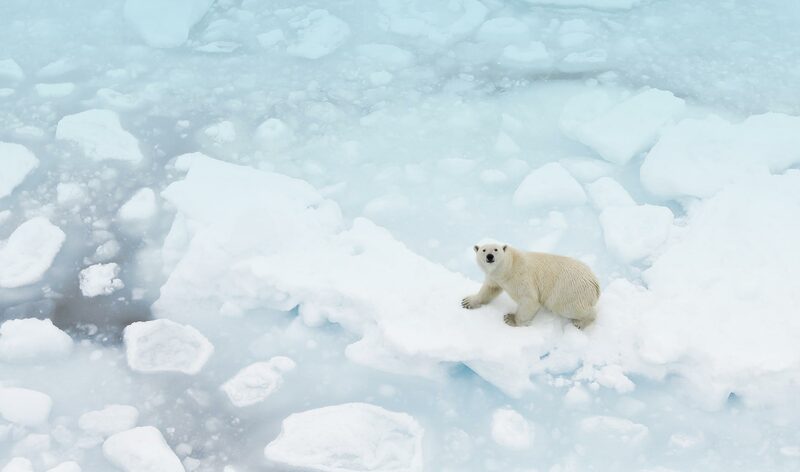 How does Arctic sea ice affect marine life? Climate change threatens to drastically affect plant, animal, and human life in Canada’s north. Professor Kent Moore’s research on the Beaufort Sea’s Arctic marine ecosystem will help reveal how things will change. By the end of this century, climate scientists expect the average global temperature to increase between one and four degrees Celsius, dramatically affecting sea levels, rainfall and animal habitats. But in the Arctic, where the effects of climate change are most intense, the average temperature could rise twice as much. Professor Kent Moore, an atmospheric physicist at U of T Mississauga, thinks that understanding how arctic warming will alter the ecology and economy of Canada’s North is vital for the country’s future. Moore has joined a team of Canadian, American and European scientists to launch a long-term study of the marine ecosystem along the Beaufort Sea shelf, from Alaska to the Mackenzie River delta. The study will expand our knowledge of everything from the extent of sea ice in the region, to how fish stocks will change, to potential targets for oil and gas exploration, to the impact on the Inuvialulit and others who inhabit the north coast. Moore, who has studied the Arctic climate for more than 20 years, has already found that thinning sea ice affects the marine food chain. Phytoplankton now blooms up to three weeks earlier than before and many animal species that time their annual migration to the Arctic to find food have not adapted to the earlier bloom. Human life will change too. Moore expects a warmer Arctic will significantly affect communities in the region, as the Northwest Passage becomes navigable during the summer and resource extraction becomes more feasible. Information gained from the study will help government, industry and communities decide how to balance resource development, economic interests and environmental protection. Measuring change in the North presents unique challenges, but the team plans to use a novel technology to gather atmospheric data: remotely piloted drones. “The drones have the capability of a large research aircraft, and they’re easier to deploy,” he says, allowing the researchers to gather information on a more regular basis than they could with piloted aircraft. Data gathered from drones and other sources will help scientists improve climate models used to predict change in the Arctic and elsewhere. For example, researchers have shown that thin sea ice is smoother then thicker sea ice, which increases wind speeds, but for an accurate climate model that can yield reliable predictions, they need more data linking ice thickness to wind speed. Another gap in current climate models concerns how small areas of open water within the sea ice can affect the climate around them. Such a patch, for example, can result in a significant warming on the surrounding region, says Moore. What will control health-care costs?